This post has been originally written by Goteo's team to be posted in the P2P Foundation's blog, as it was on the 18th of February of 2014. Although the limits of Internet’s scope are increasingly aknowledged, also is it its potential for activating innovation, empowerment and common causes. The idea around the democratizing power of the Internet seems to be also growingly extended in the academic world as well as in the activist environment, and its utility to generate innovation and wealth is not hidden in the institutional sphere and the private market. The overwhelming grown of the crowdfunding phenomenon in the recent years has emerged as a good excuse to tackle important questions within the context of the economic and political crisis we are witnessing, something we started to talk about and design in response three years ago from Goteo, after a long time immersed in the interconnected areas of the Commons and social-driven innovation, and fortunately is nowadays much more known and discussed in different spheres and articles like this one from MoneyLab. Everyday, we see more and more individuals, collectives and companies making use of crowdfunding campaigns to launch projects and initiatives, partially or completely covering the lack of funds coming from private investors and public administrations. But also as a way to include their communities and the social factor in processes such as funding, dissemination and even production. As a result, many social innovations processes coming from citizens themselves are emerging to respond to social needs and demands not efficiently addressed by the public institutions, nor the private market. That emerging paradigm, as well as generating relevant questions about the role of public, private and common oriented interests and tools in the context of this new crisis of global capitalism, should make us think about new opportunities and hybrid strategies, more “trojan horses” not only for opening processes and products but also experimenting new ways of contributing to the Commons. 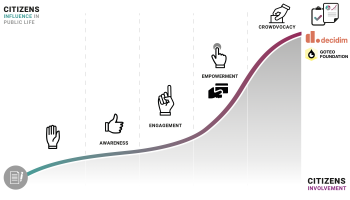 What could be crowdfunding’s role in these emerging social processes? What are the consequences of a growing funding model that someway and sometimes could delegate much responsibility and commitments to the citizens in order to support the common good and solve social demands? Could crowdfunding be practiced basing its principles on values of collective benefits, collaboration, social economy, openness, civil rights? Also involving public state and private agents, rather than becoming another mean to concentrate wealth without any social end? 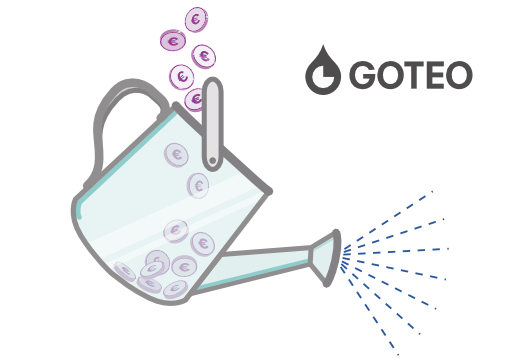 Goteo, the open crowdfunding and crowdsourcing platform, is an initiative which started at the end of 2011 and in two years has helped to reach more than 1.5M euros for open source, copyleft and Commons based projects, as well as thousands of non-monetary collaborations, configuring a community of communities. 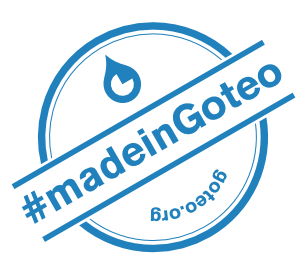 Managed by the Fuentes Abiertas Foundation, a non-profit organization created to assure the principles of openness, neutrality, transparency and independence in the development and maintenance of the project, Goteo stands out apart from being itself an open source tool for managing its “capital riego” (feeder capital fund) via specific calls with partner institutions. We also promote an experimental laboratory and develop co-creation methodologies around the Commons, open source and free knowledge in different social, cultural and economic fields, having facilitated more than 50 #LearnByFunding workshops. That means more than 1,000 people from cultural, social, academic, entrepreneurial, environmental and many other areas trained and advised on collective funding, as well as involved in facilitated discussions about openness, transparency and copyleft licensing among others for projects they care about. The Fuentes Abiertas Foundation is mainly promoted by Platoniq, an international cultural association born in 2001 that works from the social base through bottom-up processes, cooperating with public institutions, universities and companies with affinity for the collaborative economy’s philosophy and the principles of free knowledge. Goteo’s key mission is raising awareness about collective projects and benefits, mobilizing strategic stakeholders around an open/social/shared economy and channeling new funds via agile and innovative online processes. Goteo aims to help communities and projects connected with media activism, ecology, urban transformation and communal action, so they can share their knowledge with society, find collaborative resources using crowdfunding and facilitate the collaboration of citizens, public institutions and companies. Goteo believes that free and open knowledge will empower citizens and enable fair and sustainable societies, as well as boost social innovation. We consider that the democratic health of our society is hardly vinculated to its cultural quality. This, since free and open knowledge is nourished by the freedom to access and transmit information and culture, it helps to generate positive changes and improve the world. In a highly democratic and meritocratic context, Goteo has a disruptive impact on local communities, start-ups and consumer finance by supporting value creation on many levels, not just financial. It's also, and even more importantly, a great opportunity for generating free and open knowledge, as a motivation and final objective for all agents through the process. Hack several dynamics of funding in order to make them more P2P oriented, under an effective philosophy of shared responsibility and social interest. Contribute to social awareness and cross-pollination of open licenses for all kind of digital outputs, backed by people and for people. Recombine logics of cooperation with values associated to money, time and knowledge under clear mechanisms of transaction and agreement between individuals. Promote collaborative consumption based on local and ideological proximity, enabling more reliable and effective bridges between producers and consumers. Provide tools and examples for different online and offline communities to recognise similar interests and support each other, followed by the awareness and will of more people who can join them in mutual projects. Generate and improve software prototypes which can be reused and improved again and again because its source code is clear and talks by itself, with embed ideology. Defend the Commons as all those shared resources we can't afford to lose or need urgently to create, in order to leave them to future generations so they can use, enjoy and preserve them again. Provide open educational resources and learning opportunities by helping to generate digital goods from all kind of human activity, in the shape of manuals, designs, code, videos and many more. Encourage makers and DIY practitioners to build and distribute stuff, escalating in attention and access to what they produce, specially when in collaboration. Remix some patterns of corporate social responsibility so they approach open communities and its values, even for selfish or competitive interests, turning that into a “reverse logic” which can start to modify internally the way companies and corporations affect our daily lives. Continuously innovate under the paradigm of crowdfunding, following agile and open source principles, in order to test and share tools and features like match-funding, cloudfunding, forks, new agents and special users, etc. 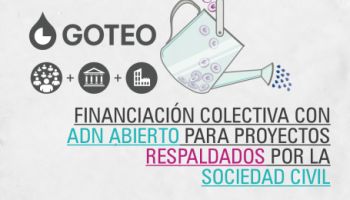 On the practical ground, Goteo is already working hand to hand with different public institutions in order to define, implement and spread new models and standards for social innovation like our “cloudfunding program”: a match-funding system where public money and resources progressively multiply donations from civil society. 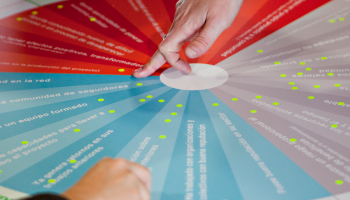 Deeply vinculated to values such as quality, innovation, responsibility, transparency, participation, accountability, openness and free transmission of knowledge and culture, Goteo's cloudfunding program allows different formulas for public and private institutions, as well as individuals willing to multiply and thus encourage co-responsible investment in projects that rely on the support of the civil society. The system relies in a “cloudfunding capital” administered transparently and responsibly by our Foundation, which also gives participating entities specific tax advantages. By bringing in non­traditional players like public administration to the open/commons field, one of our main objectives is to improve efficiency and fairness in public funding and resources, while we create policy standards to make possible hybrid formulas of collaboration and funding between public and private agents. The “dropper” figure: A public or private entity or individual gives an amount of money for a specific project, or instead a certain type of projects. The Fuentes Abiertas Foundation, responsible for Goteo, acts as "social broker" and helps the entity to find suitable projects and criteria to its organizational mission, following the area of interest related to digital social innovation, so specific current or planned campaigns are backed at the right time, improving their performance. 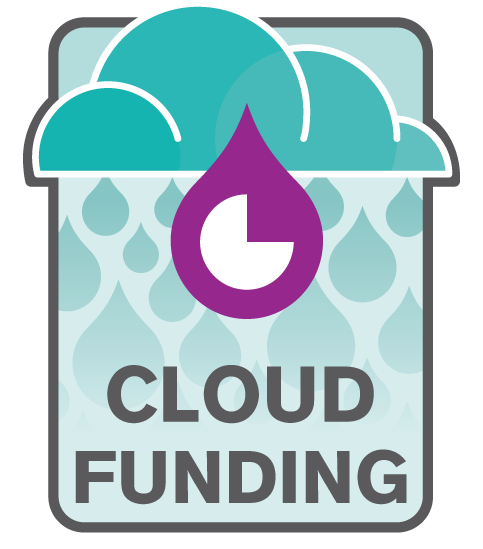 Cloudfunding calls: Specific programs (driven by themes of public interest like education, sustainability, culture, etc) encouraging private and public organizations to invest in Common based initiatives by matching funds raised from the crowd. This formula includes workshops and assessment to specific projects.This way investing organisms can give wings to some of their areas of concern and their programs in an innovative way, as well as to their political obligations and social responsibilities. We have been successfully testing with this formula during 2013 with universities, local governments and local innovation agencies. Goteo local or thematic nodes: Supported by entities and runned by independent organizations, these nodes run their own platform and replicate Goteo's services locally (such as developing workshops to attract and train social entrepreneurs, organizations and private sector around open initiatives, as well as giving consultancy and advice on crowdfunding). This strategy has already involved the regional Government of the Basque Country, who is supporting Goteo in the region, run by a cooperative (probably the best type of legal entity for this purpose), as a tool within their open data/open government policy. The Basque Country is a reference for the rest of Spain in developing this kind of initiatives and has encouraged others such as Andalusia and Extremadura regions to follow this path. The next regional node to come is the region of Nantes (France), as a hub for cultural innovation. Moving forward, we hope to develop various complementary strands to scale his work for a commons society and create further links with regional and European stakeholders. Following these type of continuous work and improvement in the tools and the strategy around Goteo, its model and demands are being increasingly considered and included in relevant policy making processes, such as the Ciudadanía 2.0, driven by the Ibero-American General Secretary, to develop a 5 years agenda to catalyze citizens innovation processes involving Ibero-American governments and the private sector, or the recent workshop hosted by Nesta in Brussels, where Goteo has advocated for improving standards and mechanisms for public funding in order to create new hybrid formulas that promote collective returns open to society. Provide economic resources to Common-oriented civil organizations representing the interests of citizens and catalyzing social innovation processes. Boost radically open innovative processes coming from the citizens; creating formal basis and legally established contracts and formulas designed and intended to promote open/free access to knowledge and information, by transparent, participatory and networked processes that claim social returns above individual benefits. Fund the promotion of a social knowledge economy, not based on hierarchical and privileged production processes but on cooperation and collaboration principales, training on digital media, creating collaborative workspaces for the deployment of innovative capacity and interaction of citizens (incubators, accelerators, citizen laboratories, experimental hubs, etc), organizing meetings between “social entrepreneurs” and “open entrepreneurs”, and promoting the principles of the social economy. Enable more channels, protocols and spaces for those organizations to introduce their criteria, knowledge and tips in the process of policy making, hiring specialized training organizations to advise and train policy makers on their social issues and solutions (social innovation, openfunding, open data, open licensing, data journalism, open government, transparency, social awareness) so they can define standards, indicators and monitor, measure and report on whether they are met. Create specific programs to define models and standards for financing commons related projects involving public resources, as well as identify good practices to help them to be playable in other countries, enabling their scalability. We need individuals and civic organizations, but also public and private entities of all stripes, whose common focus is an interest in the development of a collective, open source, knowledge-based society. Redefining your social responsibility approach: We can work with you for creating your own call for open projects, in a specific area or location. Assessing through all the process and finally allowing successful campaigns add value and solutions for the common good. Developing tools for digital social innovation: If you can share resources and priorities with us, we would be able to provide faster more tools and technical improvements in the crossroad between collective funding, community building and distributed collaboration. Giving support to world-changing institutions: We’re ready for big commitments with global leading partners, which share with us the same vision: openness is not only good, but each day critical for better societies and social development. Maybe together we could multiply resources and help more open projects grow?